Oss­-it performs the engineering and maintenance of computer networks. Our experts will find all tools necessary to design and connect any number of corporate computers into a physical network. If required, we can help you connect individual and independent networks into a single united network (by using the VPN technology and virtual local networking), as well as connect remote machines that have access to the Internet to a customer’s existing local network. The operating systems upon which our net and server work is based are Linux (primarily via its lightweight LDAP protocol for accessing catalogs) and Windows Server (by using its Active Directory technology). We can configure and provide technical support to mail and web servers, database and instant messaging servers, as well as other back­end services available for these platforms. Among other oss­it services, remote administration of networks is notable for the economic benefit that it has upon our customers, as soon as they are relieved to shift all responsibility going with the maintenance of all their computers solely to our company’s experts. As a result, the most of computer­related problems and issues are promptly and effectively addressed by means of remote connection making the help as real, as our employee was physically present in your office sitting next to you. Our expert may be also required to come in the flesh in case of a hardware­related issue. 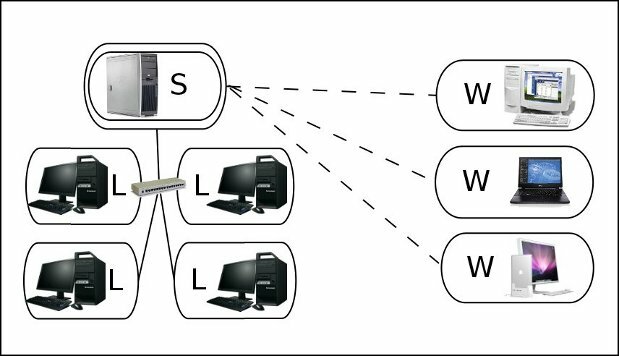 A sample illustrating a typical computer network serviced by oss­it: a local corporate network (L) is connected to the server (S) which maintains the connection with the company divisions and the employees’ home computers (W). An implementation of such scheme should enable all associated computers gain easy access to each other, to shared file storages, to terminal servers, etc.